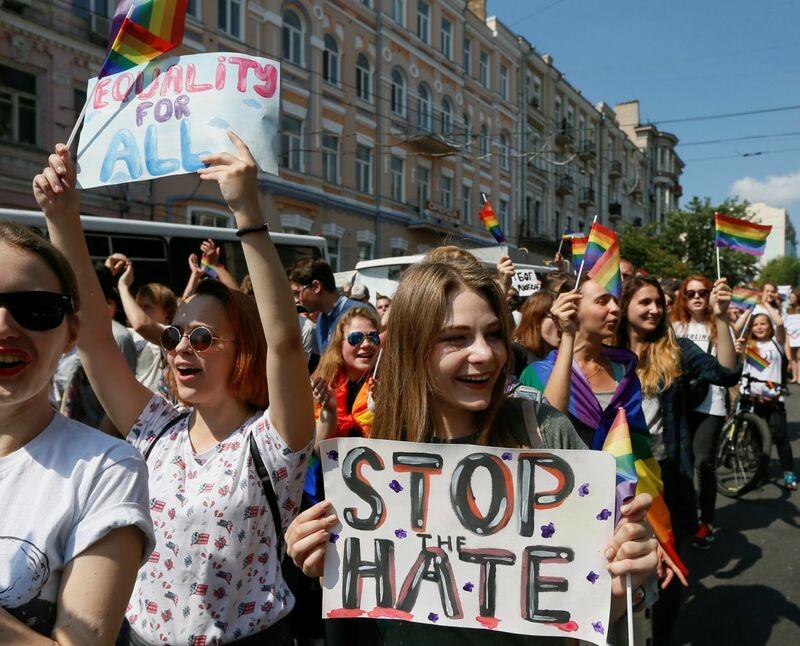 LGBT community has held the fourth "March of Equality" in Kyiv, and each time, participants faced individual provocations. This year, almost no skirmishes were reported. 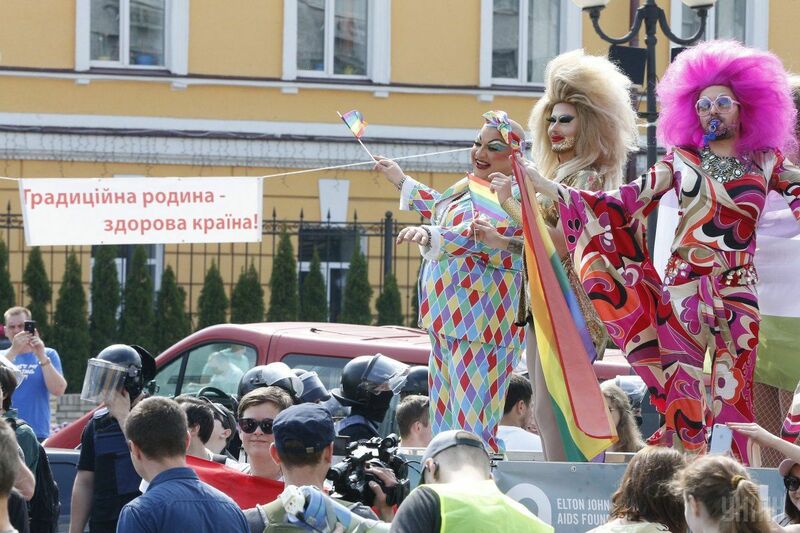 At the same time, Kyiv "March" is still far from reaching the scale of European Pride events. 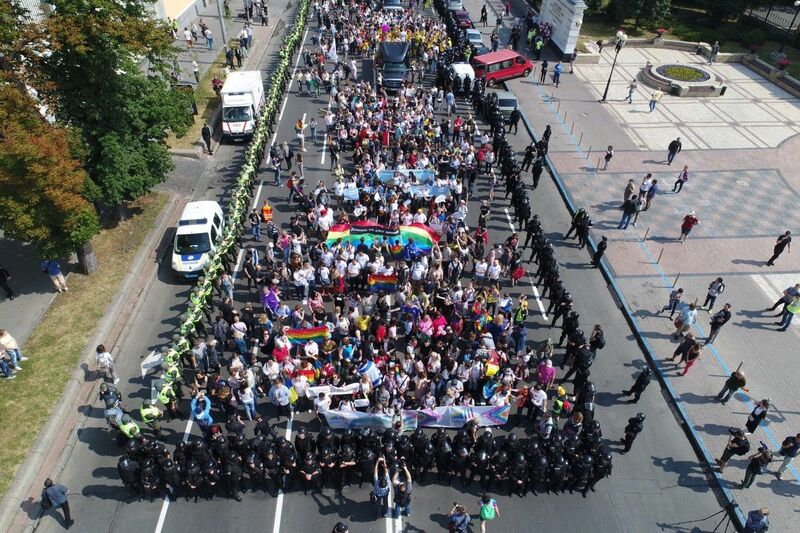 The history of the Ukrainian "March of Equality" dates back to 2012. Ukrainian human rights activist, member of the board of "KyivPride" Zoryan Kys’ recalls that back in the day the participants would team up in a rather concealed manner: 5-7 strong groups were formed at different subway stations and then headed to the Dnipro subway station where a tiny march was supposed to be held, right at the Dnipro River embankment. But that year, as the attack by right-wing radicals disrupted the plans so the pride never happened. "Until 2012, I’ve been personally against the idea of holding marches as I thought it was very a very dangerous endeavor (in fact, it is), and believed that the march would provoke excessive aggression, setting public opinion even further to the other side against our kind," the human rights activist said. "It was in the past year that I saw particularly clearly that the aggression against us actually benefits us as well. After all, a lot of people came to the march precisely because there had been threats against us, so people came there to protest against this violence," Zoryan said. 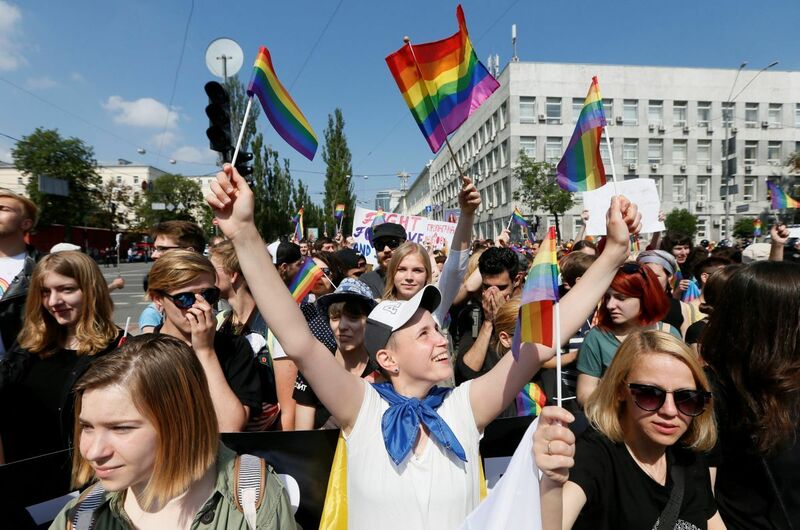 This year, KyivPride consisted of a variety of human rights events - discussions, training sessions, exhibitions - and ended on Sunday, June 18, with the March of Equality, uniting people who supported the idea of equality and the "Ukraine for All" pride slogan. However, the event’s opponents do not take this fact into account and keep branding it for some reason a “gay parade” year after year. This year has not been an exception. 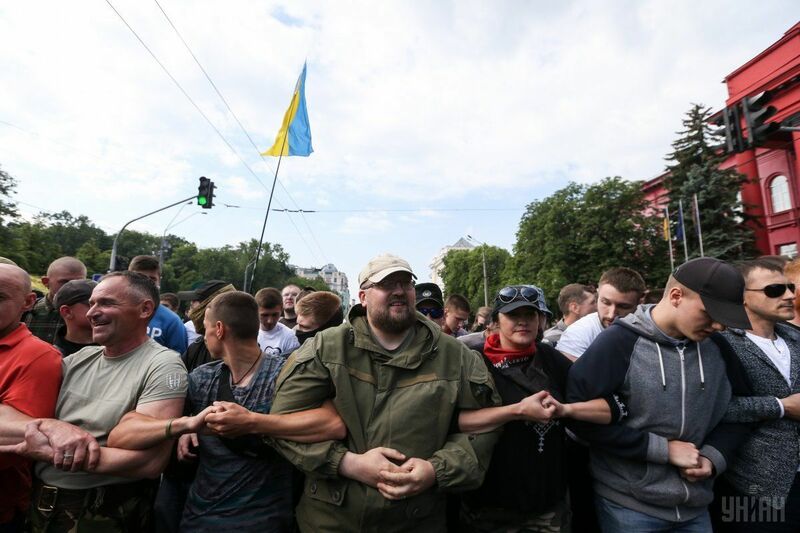 Long before the D-day, the opponents of the Equality March vowed they would block its movement across Kyiv streets by all means, since they opine the March is in fact a "Ukrainophobic act aimed against Ukrainian culture." They also suggest its participants are "an aggressive little group" who "seek to amend the Constitution of Ukraine, Article 51, which clearly states that marriage is a union of a man and a woman." Actually, there are plenty of similar myths about representatives of the LGBT community in Ukraine. Most often, homophobic organizations insist that homosexuals deepen the demographic crisis, destroy the family institution, and spread HIV/AIDS epidemic... 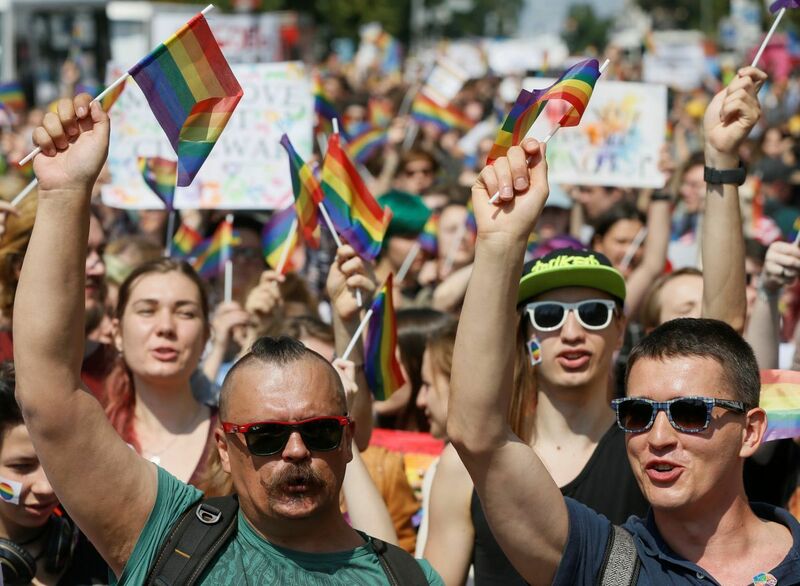 Moreover, some such organizations try to act in the style of their Russian counterparts – that is, insist on passing a law banning "propaganda of homosexuality." 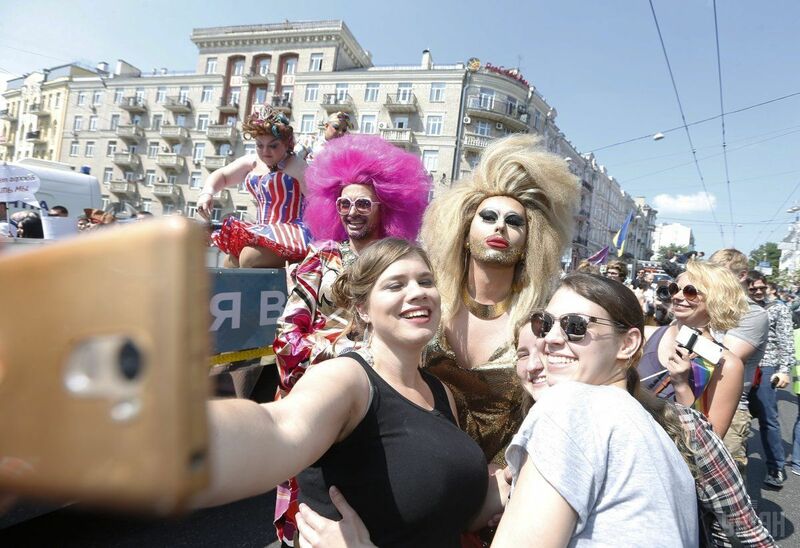 We should recall such law has been adopted in Russia, while the authorities seem to openly encourage the attacks on and even murder of representatives of the LGBT community. 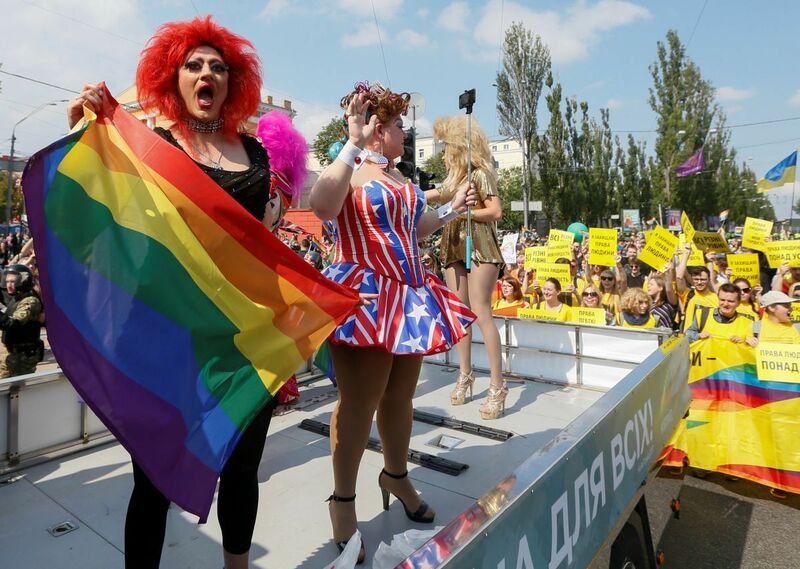 The most ardent opponents of the LGBT movement in Ukraine are organizations that refer to themselves as nationalist. On the eve of this year’s March of Equality, they pledged war to the participants of the "homosexual" events and threatened that "no police support will help you." On the night of June 18, press secretary of Pravy Sector [Right Sector] Artem Skoropadsky said that "... nationalists from many organizations have blocked Shevchenko Park, Volodymyrska Street and Teacher's House in order not to allow a gay parade in Kyiv..."
... Several hours before the start of the Equality March, which was scheduled to start at 10:00 near Shevchenko Park, several dozen opponents gathered at the location. Among others, young people stood out with Right Sector insignia and members of Love Against Homosexuality movement sporting white T-shirts. With each hour, the number of participants in the "opponents camp" was increasing, rather slowly though, while the overall situation remained calm – people were talking, drinking coffee, smoking, and strolling around. 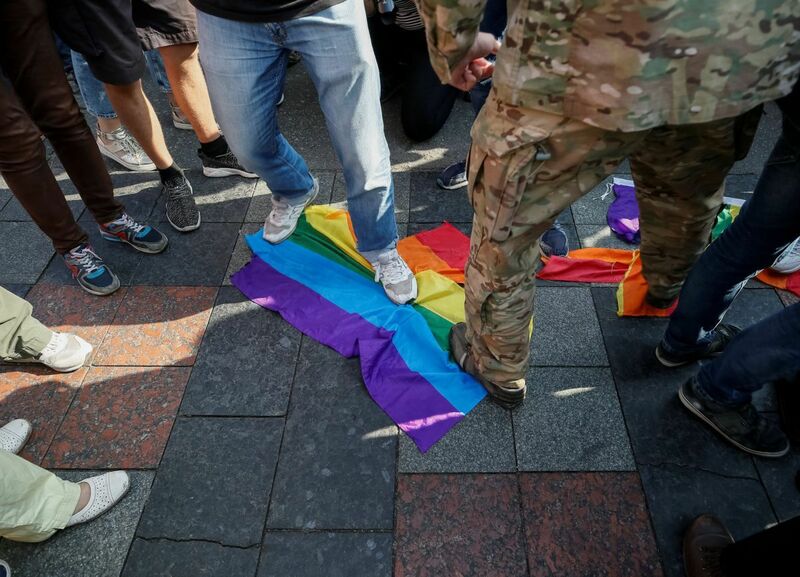 Ahead of the formal start of the March, this tranquility was violated only once – when someone came toward the group of the event’s opponents carrying a rainbow flag. The ‘provocateur’ was immediately confronted rather roughly by the Right Sector activists, while police responded immediately. The conflict only lasted a couple of minutes, leaving no significant trace. According to participants in the brawl, who talked with UNIAN, "the provocateur who brought the flag was dragged away by the police." 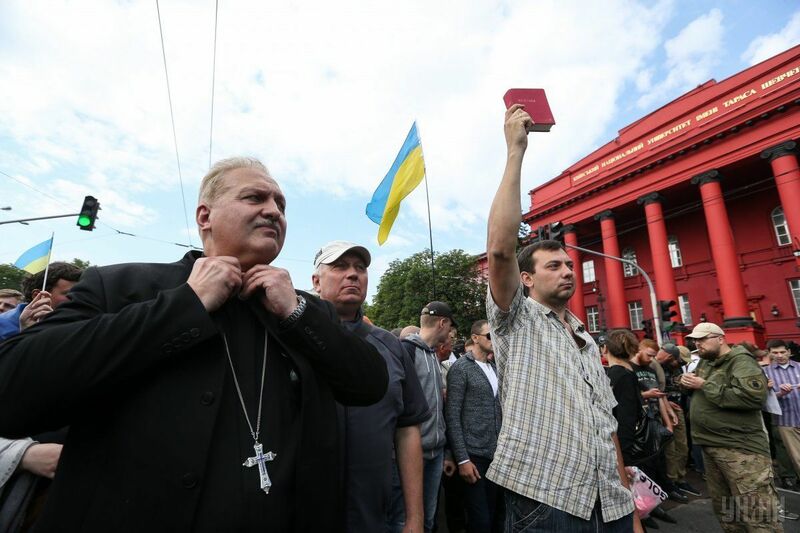 While the opponents tore the rainbow cloth to shreds, chanting "Glory to Ukraine", "Glory to Jesus," and then went on to burn the scraps. 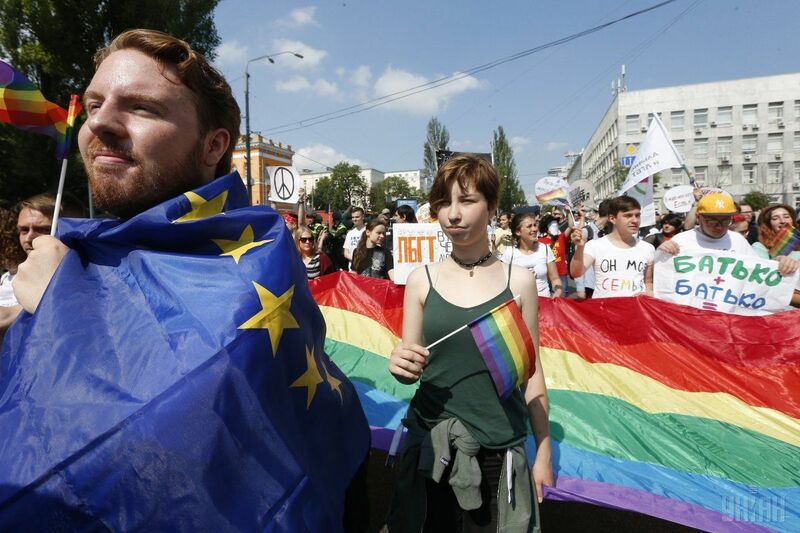 One of the opponents of the Equality March, who asked to refer to him as Andriy, shared with UNIAN his fears: "I am against this advertising and PR, in which they [representatives of the LGBT community] are now engaged. They are planning to introduce tolerance classes in schools! What does it mean? Because of these lessons, in some ten years we won’t be able to educate our children! Say, if I’ll tell my son that this guy is a f****t, he'll be like: dad, oops, you shouldn’t be saying such words." "Nobody climbs under these people’s blankets, they can do anything at their homes, but when they start promoting this before our children ... I don’t know, parents need to react somehow. We are used to saying that children are our future, but I am sure that it is up to us what kind of future we will give them," another participant of the rally ‘against the attack on the traditional family values’ Yevhenia, a mother of four, said. "They barely gave us that visa free travel, and we jumped right into copycatting the worst from Europe," said Andriy’s peer who decided to join the conversation. “Although, for example, there is no such mess in Poland or Spain, the Catholic countries. So what, are we the ones who are most leftist?" 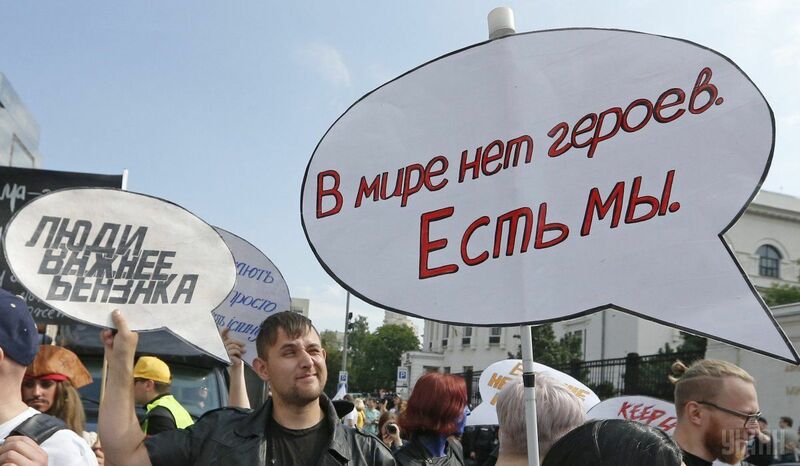 One of the participants in the anti-Pride, Yuriy, is absolutely convinced that the Equality March foments public hostility toward Ukrainian culture, thus "violating the Constitution of Ukraine". "Ukrainophobs said 5,000 would attend at their event. Formally, purely statistically, we assume that there are 2,500 men and another 2,500 women. Gender, regardless of any manipulation with the human body, was given by nature, and so remains to the end. So, 2,500 families were not created within the framework of their act, and 3,000-3,500 children were unborn," he said. The organizers of the Equality March really expected some 5,000 participants. 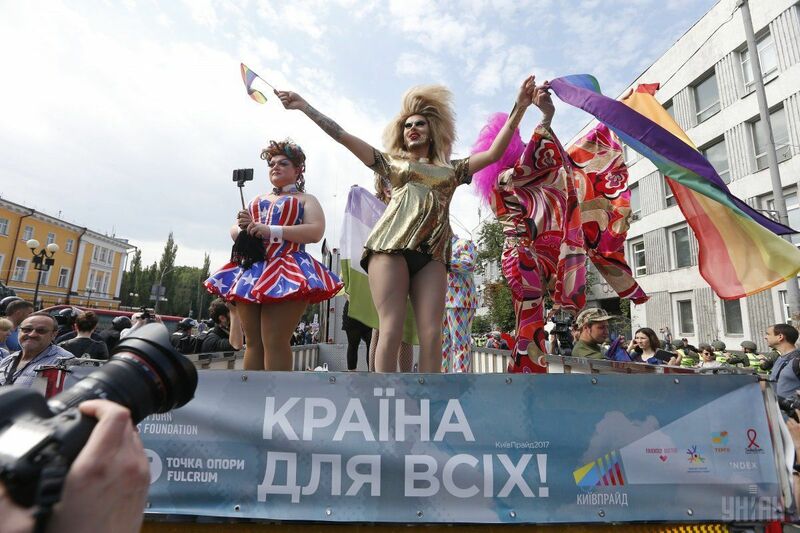 In reality, there were, perhaps, less of them, but, against the background of the previous Ukrainian Pride, this year’s event was the most ambitious and colorful one. 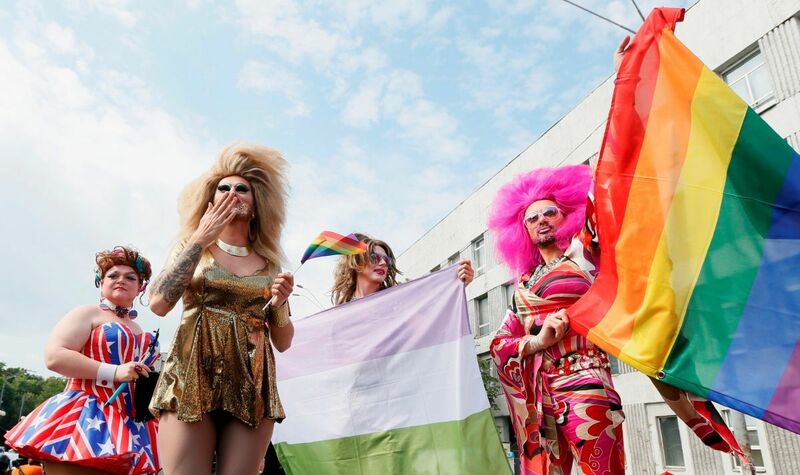 It was attended not only by representatives of LGBT community but also heterosexuals who also flew rainbow flags and posters like "Keep calm and be tolerant", "Free and equal", "Human rights above all," sporting bright outfits. A member of the trans-feminist initiative group “Adamant,” Tangar Forgart, came to the March wearing a costume of a Rocket Racoon from the Guardians of the Galaxy. "My character symbolizes that a sentient being that is somehow different from others may face discrimination. But, if one has a mind, regardless of how they look, then why the hell should they be discriminated," he notes. Daria, a bisexual girl with a disability, wore a Wonder Woman superhero costume, holding a poster saying "There are no heroes in the world – We are." "We should not sit idly by, but strive for both our rights and equal opportunities. The most important thing is acceptance by society," she said. According to Daria, such marches do help to convey to society the idea of the importance of equality. "This is a public event. And we thus publicly raise the problem, we show that it exists and that we don’t hush it down," she explains. Rostyslav came to support KyivPride from Zaporizhia. According to him, he came for a holiday. "We came to celebrate diversity and the fact that at least one day a year we can safely go out like this. [We came to] celebrate that I live in a country that should respect me," he said. It was a trio of travesty divas who created a real holiday atmosphere, like no other. One of them - a pink shock of hair, a dress in the tone of her hair – is Zhanna Simeiz. She told UNIAN that the Equality March was is necessary to demonstrate equality of rights for all: "We live in a democratic country and the citizens should understand that all people must live in Peace and friendship." 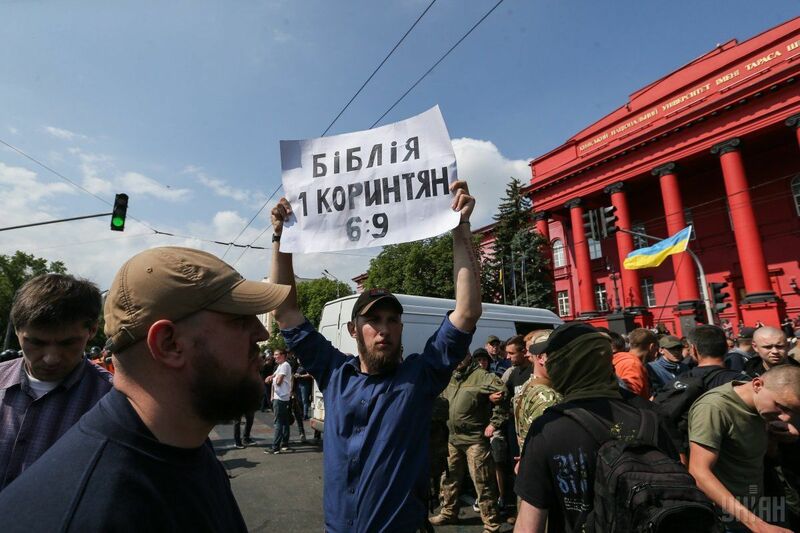 However, some of the participants of the March shaped a similar call in a poster saying "Make love not civil war," voicing – whether it’s by ignorance or other mishap – the notorious idea promoted by Russian propaganda throughout the hybrid war Russia has been waging against Ukraine. In any case, the image showing that poster has already caused an outrage on social networks in the aftermath of the Parade. In other respects, several light skirmishes with aggressively-minded representatives of right-wing radical nationalist organizations failed to spoil the very Equality March. "I am proud of all the daredevils who came out here today. I appeal to all who have not yet come out: We are waiting for you next year. We need you, because we are here to stand for your rights as well," a Kyiv resident Inessa Hashinskaya said, sharing with UNIAN her impressions of the day. ... 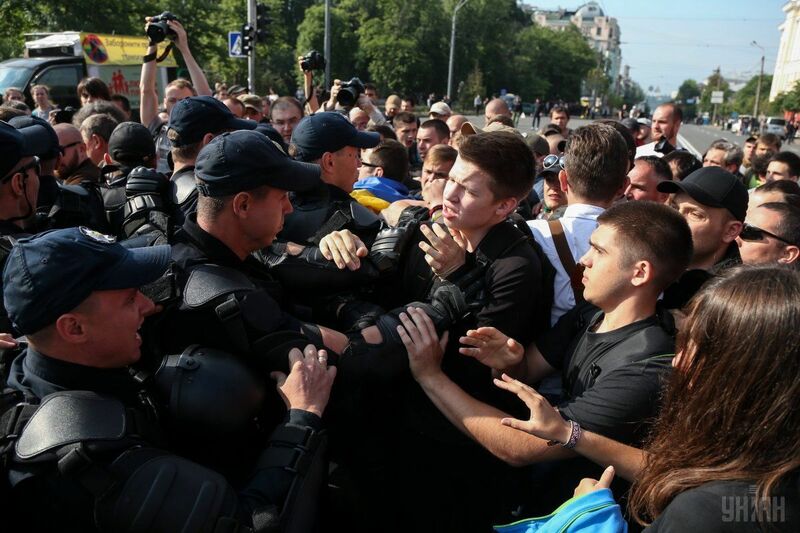 Unfortunately, just a few hours after the Equality March was over, a group of attackers assaulted several participants of the event in one of the capital’s districts. It seems that we are yet to grow to a level of a civilized society.